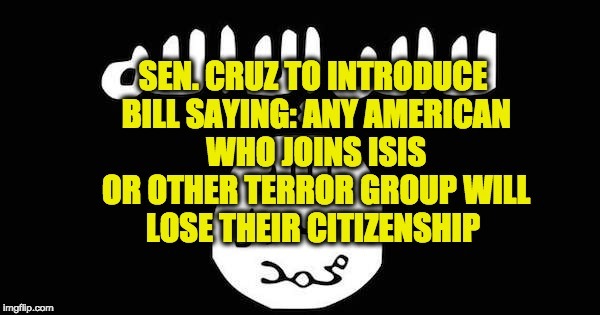 Texas Senator, Ted Cruz, wants to revoke the citizenship of any American who tries to join ISIS, help ISIS, or otherwise turns to Muslim terrorism. One has to wonder why, exactly, it is that we haven’t already made this idea into law, but apparently we haven’t. Cruz is talking about the soon to be introduced Expatriate Terrorist Act (ETA) of 2017, which would allow the U.S. government under certain circumstances to revoke the citizenship of Americans who knowingly join or provide material support to foreign terrorist organizations. Of course, the idea isn’t new. Not only has such a bill been floating around Washington for some time, for over a year President Donald Trump has been talking about better vetting to prevent terrorists from getting into the country in the first place. But the Texas Senator says that working to prevent Muslim terrorists from getting into the U.S. is only part of the equation of combating terrorism in at home. The other half of the problem is composed of home-grown terrorists — those the media often erroneously call “lone wolf terrorists — who turn to terror right here inside our own borders. We have already seen cases of “lone wolf terrorists” in America who were connected to ISIS. “If an American citizen travels abroad and joins a terrorist group waging jihad on America, attempting to murder innocent Americans, this legislation would strip that individual of their U.S. citizenship, so that we would not have terrorists returning to America using U.S. passports,” Cruz told the Washington Examiner this week. Not only have hundreds of Americans joined the Islamic State (or ISIS) at least 124 citizens and/or green card holders have traveled to terrorist-controlled areas in the Middle East and Africa to join the jihad. Cruz pointedly noted that even Hillary Clinton supported similar legislation back when she was still a Senator and posited that it is a common sense law that both Democrats and Republicans should be able to support. Sadly, this proposal has been introduced in Congress repeatedly for several years but past bills have run afoul of those skeptical of giving the government the power to summarily cancel citizenship. To address that Cruz’ latest bill adds a 60-day window to request a due process hearing to challenge the implementation. Cruz also notes that the bill about to be introduced in the House of Representatives by Republican Congressman Steven King of Iowa utilizes the same process the federal government has used since 1926 to revoke citizenship of Americans who join foreign armies at war with the U.S.A. So, he says, this latest effort is not an all new process but builds on precedent. Speaking of Rep. King, he has been worried about the failed vetting process for a long time. In a discussion about that failed process last year, Rep. King told The Daily Caller’s Kerry Picket that the Obama administration granted citizenship to up to 850 foreigners who should never have received the honor. “It seems that number might be doubled even. I want to get into that and see what it takes to revoke that citizenship. Legally, we can revoke citizenship of almost anyone if they make the violations that are clear and many of them, as I understand it, committed fraud to get the path to citizenship,” King said last September. The move will likely gain the easy support of the White House, especially since President Trump campaigned on implementing a stricter vetting process for foreigners wishing to come to the U.S. The U.S. is far from the only nation that has moved or is moving to revoke the citizenship of homegrown jihadis. Australia, for instance, passed a law to revoke the citizenship of home grown jihadis back in 2015. Australia’s legislation, an anti-terror law entitled the “Allegiance to Australia Act,” allows the country’s federal government to strip the citizenship of dual-citizens from Australia who are suspected or convicted of perpetrating terror or joining groups designated as terror outfits, Daily Caller reported. Most recently the law was cited to revoke the citizenship of Islamic State fighter Khaled Sharrouf who abandoned Australia to join ISIS in Syria. Sharrouf has a long record of terrorist activities and so does his now deceased wife, Tara Nettleton. Australia isn’t alone with its move to end citizenship of convicted terrorists. In addition to Australia, Belgium, Norway, Britain, and Israel have also begun the process of adding such a law to their books. In Israel, for instance, Prime Minister Benjamin Netanyahu asked his attorney general to look into giving him power to revoke a terrorist’s citizenship. France also moved to institute a similar plan, but the move fell apart spectacularly. As a result of the controversy, the country dropped its plan to add to its constitution a provision to revoke dual-citizenship of terrorists. Indeed, the resistance to the change in France was so stiff that the country’s justice minister quit her position over the discussion of the law. A year ago, extreme liberal Christiane Taubira, resigned in a snit as the country began debating President Hollande’s desire to have the power to revoke citizenship. “Sometimes resisting means staying, sometimes resisting means leaving,” Taubira claimed after she resigned over the proposal.